With Halloween here, and Thanksgiving not far behind, the time for companies to consider what they’ll be sending clients and gifting employees is now! BisketBaskets.com has been creating memorable corporate holiday gift baskets for years, with many of our customers relying on us time and again to deliver (pun intended!) Whatever your business, whatever your budget, we’re certain to have that special something every recipient will love, with lots of terrific options under $50. Soups On! Gift Baskets – $42.99 – Many people want to steer clear of sweets for the holidays because there are often more than enough to go around. But that doesn’t mean you have to keep out of the kitchen altogether! Our Soups On! Basket is perfect for colder months when people lean more toward chowders like the one tucked inside. You’ll also find complementary gifts, including a seasonal drink selection and Wisconsin cheddar wedge. The gift box equivalent of a snuggly Saturday on a snowy day, this gift is uniquely unexpected and a sure hit. Imperial Gift Tower – $42.99 – Three golden boxes wrapped up with a bow, this gift tower looks like a classic pile of presents. And what’s inside those boxes is fun to discover and devour! The top box is home to an assortment of sweet treats – wrapped candies and chocolates. 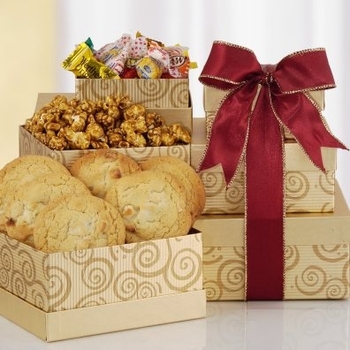 The middle box holds gourmet toffee popcorn, and the largest box premium white chocolate macadamia cookies. In this case, good things come in packages both big and small! Colorful Colorado Gift Basket– $48.99 – We’re a bit partial to this gift that celebrates our home state, packed with popcorn, trail mix, cocoa mix and more! Impossible not to giddily gobble up, anyone would love this corporate holiday gift. Halloween Gift Baskets for Grown-Up Kids! While the tradition of trick-or-treating involves going door to door in search of sweets, sending a Halloween gift basket flips that upside down, bringing the goodness right to someone special, no costume required! Halloween is very near and dear to me, and I know that I am far from alone in my love for this holiday. Not only is Halloween during my favorite time of year, but some of my fondest childhood memories were established on and around this holiday. I remember the excitement of visiting Evelyn’s house – a friend of my mother’s who created some of the most adorable costumes you’ve ever seen. Not content to send me on my hunt for Reese’s Cups and Skittles in a store-bought costume, but also not being a seamstress herself, my mother purchased couture costumes from Evelyn that I wish I still had today. It’s not every lady who remembers her measurements being taken head to toe for a velour lion costume, but I do! I remember a lot of other things, too. I remember how fun the parades were at school; I remember the sound my safety glow stick made when I cracked it immediately before heading out into the dark. I remember the neighbor who was always away on business during Halloween, but left a giant bowl of candy on the porch with a note – they were sorry they couldn’t be home, but please take a few pieces and have a Happy Halloween. I remember how excited my grandmother was to see us all in our costumes, and I remember the thrill of rounding a corner to see oh-so-many porch lights lit ahead of me. And, of course, I remember the candy. The fun of dressing up for Halloween has never dwindled. It’s been more years than I care to count since it was socially acceptable for me to wear a costume and hit the trick-or-treating trail myself, but I swear on Peanut M&M’s that if it weren’t strange, I would! I miss the thrill of approaching a house with a scarecrow on the porch, wondering with every slow step if it was someone dressed up to scare us. I miss the over-the-top decorations that many of my neighbors had, and the eerie music they played. I miss the last house I stopped at Halloween night being my own, trudging tiredly up the stairs, exhausted from all the singing and candy carrying. I miss plopping down on the living room floor and dumping my treat bag onto the carpet, separating the candy from the money and telling my parents all about everywhere I’d been. But you know what? I get to remember it forever. Even if it takes a box of Mike and Ike to get the memories flowing! Chances are good that someone special to you finds Halloween more nostalgic than scary, more fun than frightful. 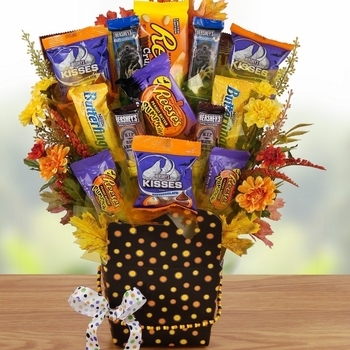 This year, send them a Halloween gift basket to help them relive the excitement that can only be brought on by having more candy than you can possibly eat in one night. Give them the sugary fuel to dust off their own memories, and be sure to reminisce right along with them! They might be a few years too old to go trick-or-treating, but thankfully, there’s no age limit at all on Halloween gift baskets.